When choosing a Myrtle Beach resort for your summer vacation, you will want to pick a resort that is family-friendly and abounding with amenities for all ages. 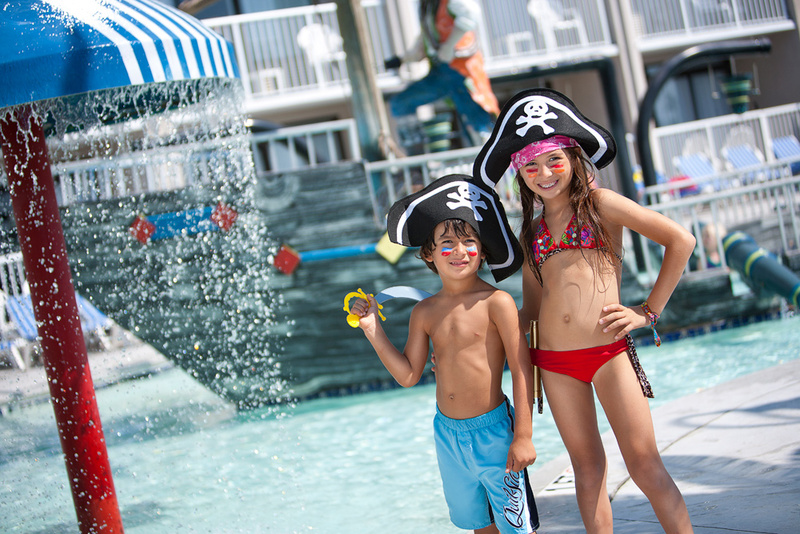 Captain’s Quarters Resort is the perfect hotel for a family summer vacation in Myrtle Beach, with amenities ranging from pools and hot tubs to dining and a bowling alley. 1. Shipwreck Lagoon Kids’ Waterpark: This amenity is by far one of the most popular during the summer at the resort. Perfect for young children and those with an imagination, the Shipwreck Lagoon Kids’ Waterpark features a ship complete with pirates, splash buckets and more! Kids can go right in the middle of the ship or play around the outside. The water is shallow enough for toddlers to have fun with their parents while there are plenty of lounge chairs nearby where parents can relax and watch the older children play. 2. Tipsy Turtle Pool Bar: Located oceanfront on the pooldeck, the Tipsy Turtle Pool Bar is a popular spot during the hot summer months. Here adults can order cool cocktails while kids can get a non-alcoholic frozen fruity drink. You can also order pizza and enjoy it with the ocean breeze on a summer afternoon. 3. Loco Gecko Beach Shak: Located on-site, Loco Gecko Beach Shak is a popular restaurant in the summer months because it offers open-aired indoor seating as well as outdoor deck seating. If your family wants to sit outside you can enjoy views of the ocean or Ocean Boulevard while you enjoy pizza, wraps, burgers, salads and more. 4. Outdoor Lazy River: While the indoor lazy river is open year-round at Captain’s Quarters Resort, the outdoor lazy river is only open during the summer months and is located at the Ocean Inn Building pooldeck, just across from the main Captain’s Quarters pooldeck. Great for those looking for a quiet, relaxing time, this pooldeck is often less busy and provides a quiet experience. Here you can float down 150-feet of the twisting and turning lazy river while soaking in the summer sun. 5. Oceanfront Lounge Area: If you want to grab a good book or just relax in the sunshine you can at the oceanfront lounge area which is complete with lounge chairs facing the ocean as well as some tables and chairs and even hammocks! It’s also just steps away from the beach where your family is sure to have hours of endless, free fun. Want to check out all of our indoor and outdoor amenities? Click here to check out our amenities section or check out our virtual tours here! Which summer amenity is your favorite?